Strengths: Kan-Ra is an excellent setup-based character. When his traps are set up with care and intelligence, he can become extremely difficult to approach, and very powerful offensively, forcing very difficult, nearly unwinnable situations on his opponent where all his options are covered. Despite being a strong zoner, he has great mobility on the ground and in the air which lets him escape the corner at times and stay unpredictable. Weaknesses: If you can knock him down or otherwise get past his zoning, he has extremely weak defensive options. His only reversal must spend one of his existing traps and it also hurts Kan-Ra directly, both with actual and potential damage. If he doesn't have a trap, he can only avoid throws with shadow Whirl, otherwise he must sit there and block the extended pressure for a long time. His close normals are a bit stubby and his mid-range normals are also a bit slow, meaning he can struggle to punish marginally unsafe moves that slightly push the opponent away on block. Because of his weak defense and layered offense, he is a difficult character to use to his full potential. Notes: Shadow Clutch is definitely what will bring Kan-Ra's damage into above average territory, so always spend at least one meter if you have access to it. Like many Season 2 characters, one set of auto-doubles is slightly faster than the other set, so using HP is mandatory for these combos. Adding a medium Swarm instead of light Swarm at the start of the 2-meter combo adds 1% to the damage and the ending Shadow Whirl will still not be breakable. Kan-ra is capable of summoning sand traps on the screen through a variety of moves. Sand traps form the staple of Kan-Ra's offense and defense and are needed for him to escape defensively or perform any scary mixup offensively. There are two main ways to summon a sand trap. The first is through the Spike special move, which places a sand trap directly under the opponent's feet, regardless of where they are on screen. On hit, Spike will knock the opponent into the air either towards Kan-Ra or away from him, depending on the strength used. The second way is via any heavy kick normal. On the ground, crouching HK plants a sand trap directly in front of Kan-Ra (coincidentally, this is also a strong anti-air button). Standing HK kicks a dust cloud at the opponent, placing a sand trap about two character lengths away from Kan-Ra. And finally, jumping HK causes Kan-Ra to perform a vertical dive kick directly into the ground at high speed, creating a sand trap where he lands; this move itself does not have a hitbox until waves of sand splash out after the sand trap is created, though, so it can be easily anti-aired. You can have only one trap on the screen, but it stays there forever until it's used. Kan-Ra has multiple ways to use these sand traps. He can use them for mobility; while standing on top of a sand trap, performing a super jump motion ( ) will launch Kan-Ra high into the air, and performing a dash will send him flying across the screen at jumping height. This can be used for surprise approaches or clutch corner escapes; while in the air, if Kan-Ra doesn't like what he sees, he can always press HK to slam into the ground and create another trap. He can use them to enhance his zoning. While standing on top of a trap, performing the Whirl special move creates a cloud of dust the travels the entire screen, destroying projectiles. To charge up this tornado, hold down the punch button from Whirl, and the tornado will be bigger and harder to avoid. At max charge, the tornado is unblockable. Kan-Ra can use sand traps for defense as well. Pressing three kicks at once will activate the Sacrifice special move, an invincible reversal that makes Kan-Ra explode and appear on top of his sand trap, perfect for corner escapes if the trap is mid-screen, but it's highly punishable if your sand trap is near the opponent. And lastly, he can attack remotely with insects out of his sand trap, causing slowdown curses to his opponent on hit, or recapturing them and teleporting Kan-Ra close for a combo starter. Note that all uses of the trap except for the insect attacks will extinguish the trap. Having a sand trap on the screen is extremely important for Kan-Ra, as without one he has no reversal attack and no way to threaten from full screen. Placing a sand trap is not especially difficult, but if an opponent is in your face, it's unlikely you will find an opening, so being proactive about keeping sand on the screen is very important. Whirl is the closest Kan-Ra has to a "normal"-looking special move out of all his combo starters. He spins violently and moves towards his opponents, recapturing them from the air and tossing them around in his tornado, but he leaves them grounded at the end for follow-up doubles or linkers, and is safe on block. A close-range Swarm attack will also start a combo, which is particularly effective when canceling close-range pressure tools like +MP. If the opponent happens to get caught in the sand explosion from Dune ( +HK in air), Kan-Ra can convert into a combo as well. Antlion ( +HK, requires sand) might be his most unconventional combo starter, but it's also one of his most common. Kan-Ra summons a huge antlion out of his sand trap, wherever it is on screen. If it snatches the opponent, it recaptures them and immediately teleports Kan-Ra close where he can begin doubles or linkers. While not super powerful on its own, its use in full-screen traps and combo situations is vital for Kan-Ra. He also can use his combo trait to cancel particularly pesky long-range Dhalsim-esque normals directly into the linker version of Spike, starting a combo. While not technically openers, these moves are still extremely useful, especially to tag nervous opponents who are standing near a trap. Clutch is Kan-Ra's ranged command grab. On hit, the opponent is slammed into the ground and bounced in the air for a juggle, and Kan-Ra can slide to the left or the right during the grab to line himself up with any of his nearby traps. If Kan-Ra does not have a sand trap or swarm near the opponent, his only way to extend the combo is to juggle the opponent with the light version of Spike and cancel it into shadow Whirl, which will recapture the opponent and allow a combo. The shadow Whirl will be combo breakable, however. If a sand trap is near, Kan-Ra can use Antlion, an unbreakable attack, to recapture the opponent and start his grounded combo that way instead. This is a common, strong combo opener for Kan-Ra, which makes the threat of a Sand Trap high. If your opponent runs into one of your persistent Swarm attacks on the ground, Kan-Ra can link a manual as is common for characters with projectiles. Also, Kan-Ra can use his two stagger normals during pressure as hit confirms. Standing HK is particularly useful because it also creates a sand trap. If the move hits, Kan-Ra can use the long hitstun to link any move of his choice and start a combo. The Whirl linkers hit 2, 4, and 6 times for light, medium, and heavy respectively, while the Spike linkers teleport Kan-Ra close and hit 2, 3, and 4 times, causing a giant sand cloud which will obscure whichever auto-double or manual Kan-Ra chooses to use next. Use audio or hitstop cues to break the auto-double, or try to react to the Spike linker instead, if you're looking to break at this point in the combo. Swarm is the most damaging linker and is fast enough during lockouts to squeeze out a few damage loops. Shadow Whirl hits 10 times, but the effect is largely cosmetic. Trying to break a shadow Whirl linker is extremely easy and can be accomplished simply by mashing MP+MK to strike any 3 of the 10 hits. Kan-Ra has interesting shadow linkers. The close range version of Shadow Swarm has a shorter-than-average freeze length and the first hit is incredibly fast after the freeze ends; most players who get locked out on this shadow linker are not prepared for how fast the first hit sneaks up on you. In fact, you can break the first hit during the freeze and the game will never lock you out. This is particularly useful if you intend to break only one or two hits and try to bait a counter breaker, because you can "set and forget" the first hit during the freeze and make the Kan-Ra player nervous even if you have no intention of continuing the break attempt. 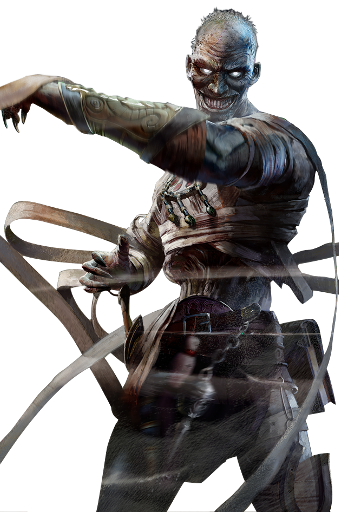 If you do decide to continue, the timing is identical to Jago's Shadow Wind Kick. Shadow Whirl is 10 hits and has absolutely no gaps after the first hit. The break windows go by so fast that the announcer doesn't even have enough time to finish yelling each number before the next one begins. The Swarm ender is Kan-Ra's best. He launches the opponent over his head, jumps up, and summons a free shadow Swarm, which slowly tracks the opponent from above, making sure they can't easily jump away, and Kan-Ra lands in time to still meaty the opponent in case they try to backdash or jump before the Swarm reaches them. Many of Kan-Ra's trickiest setups need both a sand trap and a Swarm on screen, and this ender is a great way to get the most expensive and difficult part of this equation in play. His damage ender is also pretty important, since Kan-Ra's combo damage is small without it, but very respectable when using shadow Clutch. His launcher ender will send the opponent straight up, and leave a sand trap directly under them. If you're able to launch them into a Swarm attack, you can recapture with your newly created sand trap using Antlion and continue the combo! If you have your opponent cornered at the end of a round, finish them with the Whirl wall splat ender, then throw them; they'll start the next round cursed. Antlion ( +HK with an active sand trap) is Kan-Ra's most common recapture. It's primary use is to convert any successful Clutch command grab into a grounded combo without having to spend meter or give the opponent an immediate chance to combo break. Whirl (particularly the shadow version, due to its speed) can be useful to catch some people jumping at you, or away from you, and bring them to the ground. Kan-Ra can also perform a flipout, perhaps if his opponent gets caught in one of his aerial Swarm traps and he doesn't have a sand trap handy for an Antlion recapture. Kan-Ra acts as if he has a permanent sand trap under his feet, which gives him access to all his mobility options (high jump, super dash), reversal options (Sacrifice), and zoning options (Whirl's tornado) without needing to have a sand trap on screen. He additionally gains the ability to dash-cancel his grounded normal attacks. He can also summon insects directly underneath him, though he can still create distant sand traps and use those, as well. When Kan-Ra activates instinct, he's capable of going from a somewhat calculated zoner to an aerial mobility expert at will, using his excellent jumping normals to cross-up and otherwise create havoc, and he's more difficult to pin down since he will always have access to a reversal, even if very unsafe. Kan-Ra has aspects of Dhalsim in his play style, which includes the use of Wrap normals (standing MP, standing HP, +MP). These are the normals that can cancel directly into a Spike linker, as per his combo trait, and they're very useful for keeping opponents at a distance, or preventing them from jumping or reversaling through a trap. Kan-Ra has numerous notable jumping normals, including the wild bandage-swinging jumping HP which crosses up from extremely confusing distances, the pesky MK which forces the opponent to stay in place while Kan-Ra lays a Swarm, and the multi-hitting MP which is great for pressure from a super dash off of a sand trap. Up close, Kan-Ra needs to make good use of crouching HP and crouching HK as anti-airs, +MP for pressure strings, and +HP as a hard-hitting, but slow, normal that is useful for beginning your uppercut punishes. It should also be noted that, in addition to the Antlion recapture out of a sand trap, Kan-Ra can also summon a scorpion tail at two different angles using +LK and +MK. If the tail hits the opponent, they will be cursed with a slowness spell; all their moves will have higher startup and recovery, and every character will jump much higher and slower than they normally do. Each of Kan-Ra's regular throws will also curse the opponent. The throw curse lasts for 8 seconds, while the tail curses last for around 4 seconds. The timer will get reset if they are hit with a second curse; the effects do not stack. Kan-Ra's special moves are wild and varied, but are important for understanding his game plan. Apart from Whirl (a combo starter), there are three more crucial special moves in Kan-Ra's arsenal that act differently than your typical Killer Instinct special move. The first is Spike. The regular version places a sand trap directly under your opponent's feet, which is useful for getting sand out on the screen and harassing from a distance. But the real star here is shadow Spike, which is among the best uses of shadow meter in the game. Shadow Spike causes Kan-Ra to immediately summon a "Super" Sand Trap under his opponent, which will automatically summon scorpion tails every second or so, as long as the opponent is near. These scorpion stings can lock your opponent into block stun while Kan-Ra sets up Swarm traps, and in general is a real problem for characters who need to approach through the trap. If you are sitting on some spare meter and don't know what to do with it, try summoning a shadow Spike and see if your opponent can navigate past it! It's worth noting that the super sand trap is erased if Kan-Ra summons a regular sand trap, so try to avoid using regular Spike or his HK normals while the super sand trap is doing its thing. Also, if Kan-Ra gets hit, it turns into a regular sand trap; it will stop automatically attacking, but you can still use the trap for things like a Sacrifice reversal. The second is Swarm. When used close, it hits immediately and is an opener, but most of the time, you will be using this move at range. Kan-Ra breathes out a swarm of bugs close to his face, lasting a different amount of time depending on the strength, and you can have up to five of these on screen at once (each of the LK, MK, and HK strengths, plus an air shadow Swarm and a grounded shadow Swarm). The shadow Swarms slowly start to move towards your opponent horizontally, tracking their position until they dissipate several seconds later, often making sure they can't jump or move forward. The most common way you will get a shadow Swarm out is if you finish a combo with a Swarm ender, since summoning a shadow Swarm manually is time consuming in neutral. If they get hit by a grounded Swarm, you're able to combo (for example, if you can snipe them with a Wrap normal from a distance). If they get hit by an air Swarm, you can recapture them if you're close enough for a Whirl, or if you have a sand trap nearby and can pull out your Antlion. The last is Clutch, a ranged command grab that grabs the opponent with Kan-Ra's bandages and slams them down (note that shadow Clutch is very high damage, but not 0 frames after the shadow freeze, so it's typically used as a ranged punish). Once you've grabbed the opponent, you can steer yourself forward or backward a fairly substantial distance, which will hopefully place you in range of one of your traps. If you manage to bounce them into a Swarm, or above a sand trap, that's just what you need to continue your combo via an Antlion recapture. If Kan-Ra doesn't have any traps nearby, he can hit the opponent with a light Spike as he falls and cancel into the recapturing shadow Whirl, if you have some meter available. Without meter or traps available, though, the grab is the start and the end of your damage; still respectable, but not overly threatening. This is why Kan-Ra is so setup heavy. Strong placement of Swarms and sand traps, followed by ranged Clutch/Wrap normal mixups, will force an opponent into several mixups that are not easy to escape. Kan-Ra probably has the highest learning curve of any character in Killer Instinct. He's punished strongly for his mistakes; even simply blocking a jump-in while you don't have a sand trap on the screen might spell doom for your current life bar without a clutch combo break. But when his opponent is half-screen to full-screen away, Kan-Ra really shines. Use Spike special moves to lock them in place while you build meter for pesky Shadow Spikes, and harass them with Wrap normals when they try to approach. If you land a hit, finish them with the Swarm ender (hopefully near one of the sand traps you've placed) and mix them up with Clutch and bounce them into a trap, or various normals that start combos by themselves. Kan-Ra's potential skill ceiling seems almost limitless, and players are finding out new trap setups every day, but it will require some careful play to avoid getting the sand kicked out of you for a mistake. Show me a cybernetic dinosaur.